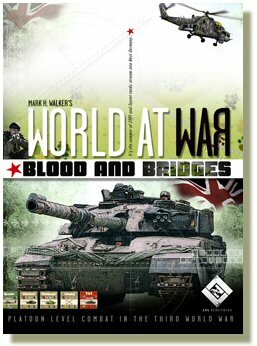 World at War: Blood and Bridges is Lock ‘N Load Publishing’s latest edition to its World at War platoon-level, Cold War era board wargame. It is very similar to the original release, Eisenbach Gap, in that it is a complete standalone game not an expansion. In fact the easiest way to describe Blood and Bridges is as a bigger, better Eisenbach Gap. Because the game is so similar to Eisenbach Gap we will not repeat the coverage from our original review and will simply highlight the new changes. Certainly the first difference you will notice is the physical weight of the game. This is due to a new board that is not only twice the size of the original but also twice as thick. The new board is 22″ X 34″ and is precisely cut and folded. The hexes are just slightly larger as well. The board art has also received a makeover and it has a slightly darker and more subdued look that helps correct the sterile feel of EG — unfortunately, the hills are now very difficult to see, but otherwise the look is much nicer overall. There are also some new terrain features that include city ruins, craters, and shattered forest hexes. The Player Aid Charts & Tables card has also gotten a makeover and it is now in full color and has a nice high gloss finish. Unfortunately it still does not include the various die roll modifiers. Also in high gloss are the counters. The gloss has some advantages in durability but could also cause some issues under some lighting. We spray our counters with a dullcoat lacquer to kill the gloss and improve durability. There are more than twice as many counters than the original EG but, unfortunately, they are equally as thin. Similar to the originals they are also precisely cut and printed. The force selection is excellent with British, West German, U.S., and Soviet forces included. Of greatest interest for us is the U.S. M60A3 company and the new close air support units. Excellent. Also getting some new flash is the all new rulebook. It is now printed on much thinner stock and lacks the cardstock cover but is now in full color. The layout is very similar to EG but unless you compare the two books side-by-side you would think the BaB book was much better, but it is just the impact of the color. Considering the great color-counter art in the game it is nice to see it now in the rulebook as well. Besides the physical changes to the rulebook there have been some actual rules changes as well. Veterans of the series will be happy to know they are very minor. In pure page count the rulebook has grown from 14 pages to 26 pages but the font is slightly larger, there are now twelve scenarios not just six, and there is a victory point table included. As for rules particulars there is a slight change to fire combat, new MLRS rules, jamming, and most significantly, there are the new anti-aircraft and close air support rules. Players can make strafing runs with A-10s at last. The new rules stick with the system’s efficient, logical nature and veterans will pick up the rules changes in just a few minutes. Overall, if you liked WaW: Eisenbach Gap you will love WaW: Blood and Bridges. It is bigger and better in every way yet has only minor rules changes. If you have not tried the World at War system yet this is a great place to start. If you have any interest in Cold War era combat or platoon-level wargames this is a must get. Recommended.